A limited-edition illuminating powder with an ultra-smooth formula and radiant finish. 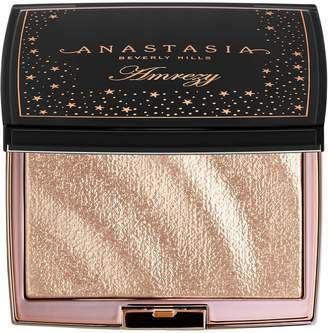 Anastasia Beverly Hills has collaborated with Instagram beauty sensation Amrezy to create this universal shade for highlighting the face, eyes, and body. The powder formula can be applied wet or dry, and comes packaged in a luxe compact with a mirror. Mix this highlighter with a hydrating oil for an all-over glow. HOW TINTY IS THE NEW ANASTASIA X AMREZY HIGHLIGHTER? T E X T U R E : The first thing we noticed from the gorgeous sand dune print of this highlighter is it has a very different formula. Use your fingers or a brush to swipe, and there’s literally no fallout, which is common with most highlighters. The formula is not powdery, and the texture is smooth without being creamy. more we wear it, the more we’re obsessed. The highlighter is super wearable for everyday, lit-from-within sheen, but if you want an extreme glow to Amrezy heights, you can layer it on. Take note: the brush you use matters. We suggest a fluff brush for maximum, even payoff with this formula. We even use it on the inner corners of our eyes, as eyeshadow, and even on our shoulders – basically, we would bathe in it if we could. It costs $28 for .31 oz, and for this glow, it feels worth skipping a week of Starbucks – props to Amrezy for keeping it #TINTY!